If you have been considering alternative options for transport, then perhaps this sleek and fancy looking electric scooter bike could be something for you! 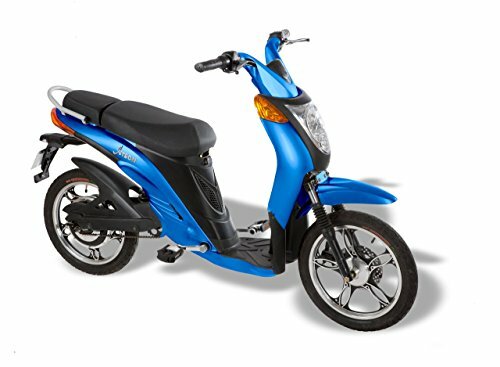 It comes in red, blue and timeless silver, has a moped-like design and goes for up to 20mph. This eco-friendly beauty is fully electric and runs on batteries, it is easily operated and perfect for getting from one point to another, for long outings that might make you tired of walking, for injured and elderly as well as for driving practice for a responsible teen. When looking around for an electric scooter, it can sometimes be hard to know where to start, but it is close to impossible to see this product and not fall instantly in love with it. The Jetson Electric Scooter is here to take you where you need to go, when you need to go. The aluminum alloy frame is sturdy and high-quality – there to give you the experience you hope for when purchasing an electric scooter. It comes in bright red, deep ocean blue and a fancy-looking gray shade so that you can pick a color that suits both your personality and your preferences. This can be more important than you think, as it is important for many to have a transportation aid that reflects who they are as individuals. The scooter looks very much like a moped and runs with stability down any road you will want to go on, so that you can safely get from point A and to point B, regardless of whether you are just going down the block or over to a friend’s house on the other side of town. The max speed is 20mph – just enough to get to your destination within a reasonable time frame, it has a 30-40-mile range on a single charge and supports a total weight of 300lbs, which is more than the average electric scooter. This makes the scooter accessible for more people, and since it is the total weight it makes it possible to bring a child along, standing up (preferably with a helmet), just for fun. The max speed is considerably high for what it is, and it is about as fast that you can legally drive a vehicle without needing a license. This electric scooter turns on with a key and a simple twist, which makes it feel a bit safer to leave it outside unsupervised. A key is also used to remove the concealed (under the seat) and powerful Lithium-Ion battery from the frame – another security measure – and unless you are in possession of the key you simply can’t remove the battery. The battery is rechargeable and can be charged anywhere as long as you have your portable charger (included) with you, so make sure you always keep it in your bag when going out on the scooter. It is a great idea to leave it charging while having a cup of coffee with a friend, while at work or when taking a lunch break so that the scooter will always be ready to go – just like you. An LCD display is located right between the handlebars, it has a clean and simple design and it allows you to keep track of your speed, battery life and the distance you have traveled, which in turn avoids unpleasant surprises such as an empty battery at the most inconvenient of times. The display is both easy to understand and to see even when it is dark, and it is always switched on as long as the scooter is running. It is important to be safe while on the roads, and this product has integrated LED headlights and brake light, that shines bright enough for you to be seen from a long distance away. There are turning signals as well, just like on a moped or motorcycle, to ensure that everyone knows where you are, in what direction you are turning and where you plan to go next. Road safety is important regardless of what type of vehicle you drive, and thanks to these features you can now drive safely to and from your destination. A fun addition to this product are the pedals – allowing for it to be powered like a regular bicycle if wanted and needed (should you, for example, run out of electrical charge). The pedals can be folded in when not used so that they won’t be away while you are driving the scooter using electrical power. It also comes with 18” rubber wheels, a front disk, rear-drum brakes, and the total weight of the Jetson Electric Bike is about 110lbs. It is heavier than some similar products, but looking at its construction and how sturdy it is – it isn’t hard to understand why. The electric scooter bike only comes in one size; a standard 69.25” x 41”, making this electric scooter suitable for most adults, elderly and even for older teenagers. It is easy to use, arrives mostly assembled where only the mirrors need to be added, and a user manual is included to make sure you can get started right away! As an extra plus, there is a highly responsible customer service available to answer any questions and concerns, and the manufacturer offers a money-back guarantee if you would be unsatisfied with the product. Driving an electric scooter is a big responsibility, especially when driving one like this that requires a bit more of its driver. It is heavier and larger than many similar products and is, therefore, most suited for older teens and adults. Looking at it – it looks just like a moped, and should, therefore, be treated as one, even though it doesn’t go quite as fast. It is not a toy for kids, but instead a reliable mean of transportation for responsible individuals. It can be driven on roads and taken to work or college, or why not use it to endure more during a family outing? The Jetson Electric bike is also a great option for elderly individuals who might not be able to walk as much as they used to, as they are sturdy and reliable, and requires minimal physical efforts when driving and managing. It is a way for grandpa or grandma to be able to come along on that trip to Disneyland or to the farmer’s market so that the whole family can enjoy time together regardless of physical abilities. With this in mind; it is also a great option for temporarily injured individuals, who won’t have to worry about getting on and off a bus, and who can take the electric scooter to nearby locations instead. The seat is comfortable and ergonomic enough to sit on for several hours, so don’t let that broken leg or busted knee stop you from going out with your friends or family! Everything is possible, and sometimes it is a good idea to accept a little aid in moving around freely. There are so many different types of electric scooters to choose from, but this one stands out since it looks a lot more like a moped than a regular scooter, which makes it an attractive option for those who want to look great driving around on their transportation aid. Getting around town should be fun, and this product is user-friendly enough to be used by just about anyone who has the maturity to ride around on a 20mph vehicle. 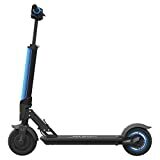 We also like the additional weight capacity; because while most electric scooters tend to have a weight limit of 240-250 – this product can carry up to 300lbs. There are so many people today that could need or want an electric scooter, for whatever reasons, and inclusion is incredibly important. 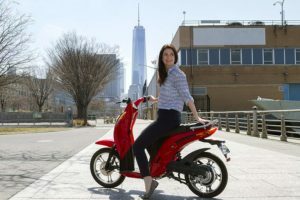 This also means that this electric bike like scooter does not just look heavy-duty and durable – but that it actually is. For someone more light-weight it is also possible to take an additional person, such as a child, for a ride around the block, which tends to be appreciated. The obvious benefit of this electric scooter is just that – that it’s electric. We are living in a time where we need to start thinking about the environment, and by purchasing an eco-friendly transportation method rather than one that runs on gas, we get to contribute our tiny grain of sand in an environmental fight that is only just beginning. The Jetson scooter is easy to charge, lasts for a long time (enough to go on fun adventures) and drives surprisingly fast for an electric scooter, and it makes it exciting to do something for the environment! With the technology and inventions of today, we no longer need to sacrifice comfort and function to live more environmentally friendly, and this excellent eco scooter is the perfect example of what can be achieved without further damaging planet earth.